10 years of pain has disappeared! My dharma name is Hua Yong. I am blessed to participate in the Guan Yin Bodhisattva of Great Compassion Empowerment Dharma Assembly. We started off by diligently reciting the Six-Character Great Bright Mantra. After a dozen of recitations, tears kept emerging as I kept reciting the Six-Character Great Bright Mantra. I did not know why I had tears, but it felt comforting and soothing. Minutes later, a bright white light shone towards my face, the light then transformed into a rainbow colored beam of light and eventually formed into a very large lotus flower of clouds. Immediately, I felt energy surging from the floor where I stood up through my entire body. My eyes were shut and I stood still as I felt my body very heavy. Sounds of a lion’s roar and footsteps were coming from the hallway People behind me started to pat their own bodies. Sister Hua Rui walked passed me while singing out loud. Qinbu Rinpoche joined in shortly after. Eventually, I started to recite “Namo Guan Shi Yin Bodhisattva.” Every syllable was dragged out loudly. Suddenly, Sister Hua Rui began to deliver Guan Shi Yin Bodhisattva’s message out loudly in Cantonese, “We are all destined to be here today. You have acted sinfully in your past lives. You must repent your actions!” I thought to myself, “Of course, of course.” I felt a moment of despair as I began to cry while reciting “Namo Guan Shi Yin Bodhisattva.” Moments later, all I could see was a red circle in the middle of darkness. This could possibly be the symbol of my karma, I thought. I immediately requested a blessing from the Buddhas and Bodhisattvas to clear my karma, be diligent in my practice as well as bring my husband and daughter to practice Buddhism! After requesting this blessing, I began to sing even louder and more passionately. My arms naturally began to swing from side to side, however, both of my feet remained still. Meanwhile, while Qinbu Rinpoche was singing, she came behind me and started to slap my shoulder all the way to my lower back. It felt very painful as I felt that Qinbu Rinpoche’s palms were very large, however, I continued to stay still and recite “Namo Guan Shi Yin Bodhisattva” out loudly and prolongly. Sounds of people crying, falling to the ground, slapping, people reciting the Six-Character Great Bright Mantra and “Namo Guan Shi Yin Bodhisattva” were being heard everywhere in the hall. Shortly after, I heard the master say “Stop”, but I kept going on. I did not know when, then Qinbu Rinpoche came behind me and slapped from my shoulder to my lower back again very intensely and I could not stop singing in a high pitch. It was until the master came to me and tapped my head that I stopped. 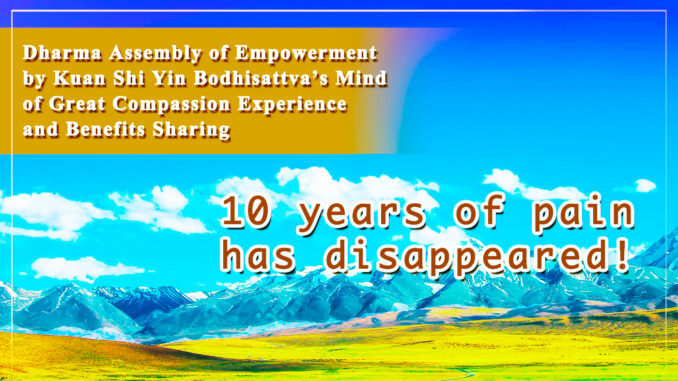 It felt as if time flew by really quickly as if the Dharma assembly ended really quickly. However, I am sure I received an extraordinary amount of empowerment and blessings even though my body still felt heavy. After the Dharma assembly ended, a lot of sisters and brothers went up on stage to share their personal experiences. I also went up to the front, knelt on my floor with my palms together, and from the bottom of my heart, I shared my experience and expressed my utmost gratitude to H.H. Dorje Chang Buddha III, Namo Guan Shi Yin Bodhisattva, and all other Buddhas and Bodhisattvas. Returning home, I found out that 10 years of pain and failed treatment on my right shoulder and spine has disappeared! Back then, because of my right shoulder pain, turning my head to the right was not possible. But now, I can do that without any problems! My most sincere and grateful thoughts to H.H. Dorje Chang Buddha III! My most sincere and grateful thoughts to Namo Guan Shi Yin Bodhisattva! My most sincere and grateful thoughts to all Buddhas and Bodhisattvas! I Am Grateful to H.H. Dorje Chang Buddha III and Hua Zang Si! May we all embrace the love and kindness of Guan Shi Yin Bodhisattva. I’m really happy for you. Namo H.H. Dorje Chang Buddha III !! !